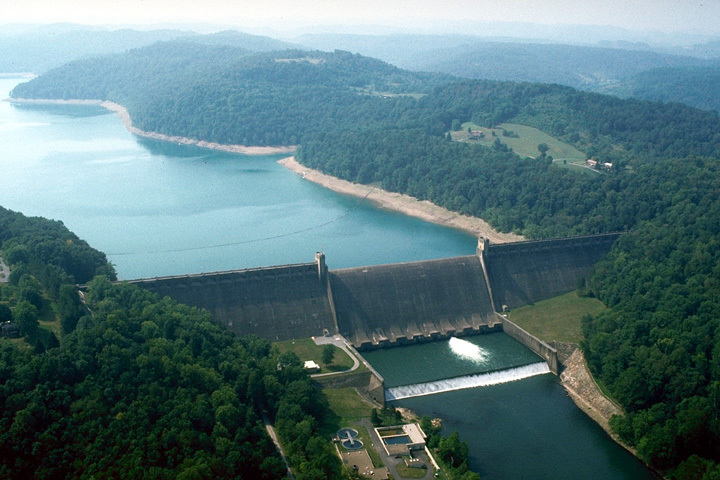 Tygart Dam, the first major gravity flood control dam built by the U.S. Army Corps of Engineers, was built between 1934 and 1938. Tygart Dam’s genesis came in 1933 after Major William Styer of the U.S. Army Corps of Engineers Pittsburgh District recommended building a reservoir dam on the Tygart River to assist in flood control and provide supplemental water to the Monongahela River navigation system during periods of low water. The New Deal’s Public Works Administration approved Styer’s recommendation in October 1933 and allocated funding for Tygart Dam in January 1934. Hence, the first great concrete high dam of the Ohio River watershed flood protection system became a reality between 1934 and 1938. According to the Corps of Engineers, the dam cost $18.5 million to build and has, since its completion in 1938, prevented more than $1.2 billion in estimated flood damage. 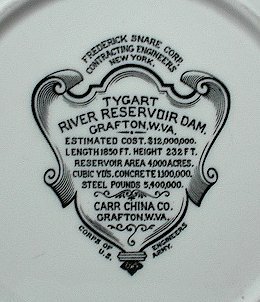 The construction of the dam was a great event in Grafton and surrounding Taylor and Barbour counties. The dam brought new jobs to the area and has become the source of pride for Grafton residents. The recreational benefits of the lake, as well as the navigational benefits provided, are but a few of the reasons Tygart Dam continues to benefit the region. 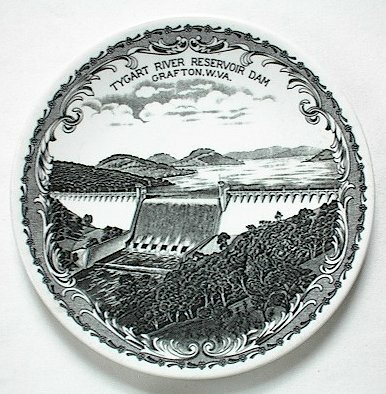 Carr China celebrated the construction of the dam with a commemorative plate. The ever collectible dam plate design can be found in numerous colors and plate styles, including the extremely rare and collectible fruit compote. The dam, as it appears today, sat less than a mile up river from the Carr China factory.